This weekend I met the aliens, and they spoke pretty good English. They were Klingons. Yes, bearded, bulky Klingons, sawtooth-eared Vulcans, grunting Romulans, and clean-cut graduates of Starfleet Academy had all amicably come together in Seattle’s Science Fiction Museum for a three-day toast to Star Trek. This was a gathering of fans, drawing a few thousand Trekkies from around the country. But it had a novel twist: the usual crowd of Star Trek devotees and show celebrities was leavened by a fistful of scientists. Real scientists; not just the play-acting kind. The scrappy, low-budget series, which was cancelled after three seasons, became known for its imposing repertoire of futuristic gadgetry. There were handheld communicators and tricorders; shipboard holodecks, giant view-screens, and deadly phasers. Some people today have come to believe that Star Trek’s creators possessed a crystal ball, simply because of the resemblance of some of this paraphernalia to contemporary, hi-tech hardware like cell phones and plasma TV’s. Consequently, one reason that scientists were brought to Seattle was to offer opinion on the degree to which this science fiction had, indeed, inspired science fact. The answer turned out to be “not very much.” The most conspicuous reality check came from Martin Cooper, the man credited with inventing the cell phone. Cooper pointed out that the development of portable phones was underway long before Captain Kirk ever flipped open his communicator. Most of the other Enterprise hardware remains either impractical or impossible. But if Gene Roddenberry and the Star Trek writers weren’t particularly prescient when it came to the technology, they were definitely out front when it came to social evolution. The Enterprise crew sported archetypes from around the globe, and – get this – a black woman. In reality, Nichelle Nichols, who played Lt. Uhura, the always-attentive Communications Officer (and obviously a dedicated SETI researcher – constantly listening for alien signals), nearly quit the series because of behind-the-scenes harassment. Martin Luther King urged her to tough it out however, and Nichols became an inspiration, and later a friend, to Mae Jamison: the first black, female Shuttle astronaut. It’s worth remembering that at the time the original series aired, multiculturalism was hardly a national passion. So it was a major social innovation to suggest that only a few centuries hence, everyone – irrespective of race, gender or ear morphology – would qualify for such plum jobs as zapping hostile aliens. But there’s another important component of the Star Trek legacy: something that continues to shape our attitudes to rocketing beyond our world. Star Trek re-defined space. Consider Europe five centuries ago, when the “final frontier” was the ocean that lapped Iberia’s western shores. Any chart would end within a hundred miles or so of the coast, and the Atlantic beyond that thin edge was presumed to be filled with sea monsters and dragons. To venture far beyond land was to enter lethal territory. In contrast to this fearful belief stood a few legends that told a different tale: the Greek story of the Argonauts, for example. To the daring seamen in this ancient epic, the unprobed frontier beyond the shore wasn’t the exclusive province of hungry monsters, but was home to wondrous beings. Adventure lay beyond the horizon. A millennium later, the siren song of the Argonaut legend encouraged Renaissance sailors to dare the rollers of the open ocean, and eventually discover the world. At the dawn of the space age, Star Trek did the same for another frontier: the bitterly cold, dauntingly hostile voids between the stars. For millions of people, outer space became a good place to be. Space promised adventure and hinted at amazing discoveries. It’s a mythos we believe today. What’s remarkable is that we take for granted that we always have. 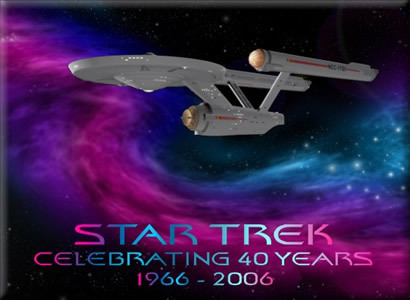 As I wandered the halls of the Seattle convention, watching aging actors sign photos of themselves as they once were, and chatting with fans costumed as they would dearly love to be, it occurred to me that there was truth to the insouciant claim that Star Trek was much more than a TV show. Star Trek convinced an entire generation that space is not simply the empty tracts through which the stars course their lives. It’s a place we are manifestly destined to go.